Coexistence as the word suggests is a result of a combination of at least two or several distinct as well as similar elements, which can be arranged in physical, visual and meaningful settings to achieve an intended function. 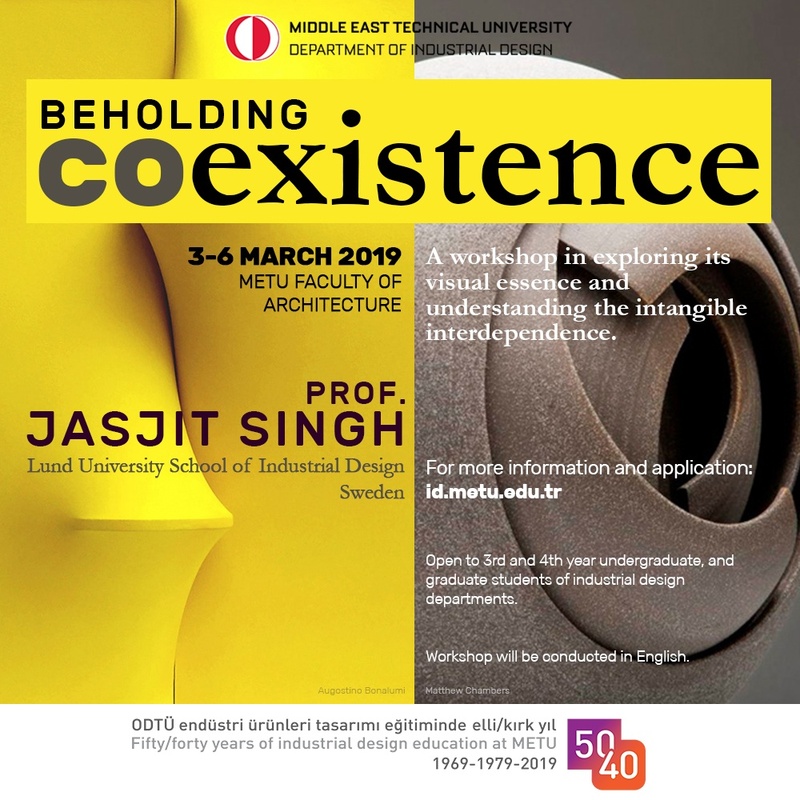 In other words, ‘Beholding Coexistence’ is a way to explore and observe how easily things could come together, adapt, transform and what could they convey in various creative, aesthetic and innovative ways. We try to bring together as many different skills, viewpoints, mindsets and approaches from a mixed group of students to contextualize the idea of coexistence as creative expressions that are understood by everyone, which is our main objective. This is further explored through short initial assignments on how one creatively ‘Objectifies’ this expression to see it transform into physical objects, functional structures or experiences which may be proposed through meaningful applications and examples in everyday life or for our immediate future. This could be done in various ways by utilizing the unique properties of a specific material and its structure, the inherent and extreme behaviors, or their pure visual characteristics along with physical properties. After working on a few individual assignments to understand what do you mean by coexistence, you are then encouraged to collaborate with others to collectively address a few issues provided in the next steps. These issues might range from social relevance, functional viability, materiality, spatial or visual commonalities to create the concept for beholding coexistence. Such issues are also likely to become the influencing factors and key drivers to generate ideas and proposals for a collective main project. The abstract and aesthetic nature of various ‘Beholding Coexistence’ concepts are expected to form the collective visual expression of this workshop. This workshop looks into the various ways of visualizing how you would define, analyze, express and objectify these issues as visual solutions, meaningful details, tangible products and recognized experiences seen in our everyday lives. Jasjit works as an industrial design professor at the Lund University School of Industrial Design in Sweden. A graduate in industrial design from National Institute of Design in India, he has more than 20 years of diverse professional experience working in different areas of design ranging from education, design practice in the automobiles, medical, home and office appliances to designing color systems, experiential spaces and narrative museums. A specialist in the area of product form, user experience and semantics, Jasjit works in the cross-over domain of industrial, transportation and interaction design. He has taught as an industrial design faculty and coordinator for product design at National Institute of Design. In 2005 he joined as a lecturer in form studies at the Umea Institute of Design in Sweden and ever since focused his work in linking product form and styling practices with user experiences and semantic approaches in product design, which he continues to teach at Lund University since 2010. He has also been a consultant, advisor and visiting faculty conducting workshops in several prestigious design schools of international repute and leading design offices in Europe and India. Over the years, Jasjit has constantly tried to cultivate a multidisciplinary approach towards problem solving by working and collaborating with various design teams around the world. His current area of interest is about investigating how the form of a product can be perceived beyond its physical qualities. He continues to conduct workshops to explore different ways of enriching the user experiences, exploring future scenarios and enriching the user experiences in order to create meaningful directions for design expressions within and around the products to come in future.